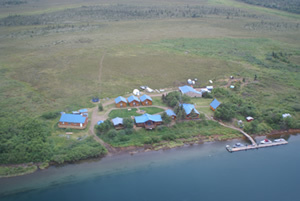 Your guide to Bristol Bay Alaska lodges and guides who provide fishing for giant rainbow trout and king (chinook) salmon on the famous rivers of the region such as the Kvichak River, Naknek River, and the world famous Nushagak River where the fish are plentiful and grow to enormous, only in Alaska, sizes. Where is the "Bristol Bay" area of Alaska? The famous Bristol Bay area lies in Southwest Alaska starting about 200 air miles from Anchorage. The Bristol Bay area encompasses all those rivers and lakes starting from around Lake Clark and extending to the Naknek and Alagnak Rivers and on to the Togiak River. Generally bounded on the North by the Holitna River (which is technically not part of Bristol Bay as it flows into the Kuskoquim River), the Bristol Bay area consists of all those drainages that dump into the Bristol Bay of Alaska. The largest rivers feeding the bay are the Nushagak River and the Kvichak River. 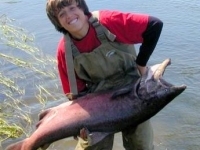 In general, the fishing season in the rivers of Bristol Bay starts around June 15th for most lodges and guides. In particular, there is excellent fishing for all resident species at this time. Some of the best fishing for Arctic Char, Dolly Varden Trout, Rainbow Trout, Lake Trout, Northern Pike and Arctic Grayling occurs in June. Fishing for King (Chinook) Salmon, Chum Salmon and a good possibility of Sockeyes, also starts at this time with run timing having small changes from year to year. 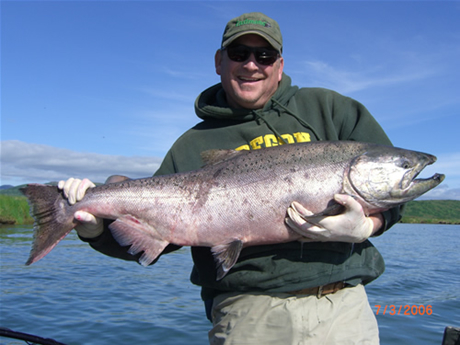 The King Salmon and Sockeye run peaks in the bay and at the river mouths around the 4th of July each year. Timing your fishing trip to hit the peak of the runs is not totally necessary as the fish spread out in the river systems after they flood in from the bay. Many lodges fly their anglers out each day to that section of the rivers where the fish are most heavily concentrated. Most lodges and guides end their season in the first 2 weeks of September after the Silver salmon runs have peaked. 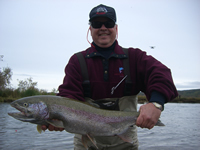 August and the beginning of September is also a great time for rainbow trout fly fishing. with all the creature comforts possible. Perhaps most importantly, the rivers of Bristol Bay have the largest run of King (Chinook) Salmon in the World! © 1996-2016 Alaska Internet Marketing, Inc.